Here you will find case study photos and x-rays of Dr. Kissel’s actual patients. Click on photos to see full size images. Patient 1 presented with a fractured tooth #10 (left lateral incisor) associated with a large infection. Unfortunately, the tooth could not be saved. He did not want a temporary removable appliance and we were able to exceed his expectations using the SMILE technique. 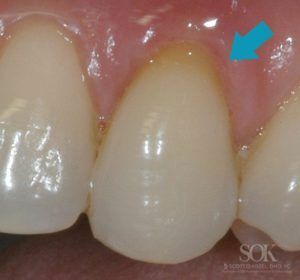 In one appointment, using microsurgical techniques, he had his tooth carefully removed, an implant placed, insertion of a very biocompatible (composite, not acrylic) tooth and bone grafting was performed. The middle photo shows his condition only 1 week after the procedure. As seen, no trauma is visible. Patient 1 had an excellent result with little to no discomfort. 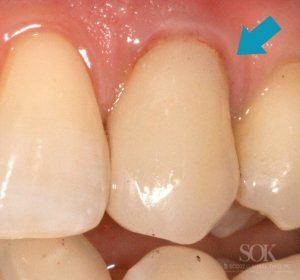 As an aside, an infection does not preclude you from having an immediate implant. The right photo shows the final result. Patient 2 presented with a fracture #9 (left central incisor) which also showed root resorption on the 3D scan. In one appointment, patient 2 had the SMILE technique. He left the office the same way he presented, with an implant supporting a very esthetic biocompatible temporary tooth. He was pleased with both the temporary and final tooth. The photo on the right shows the final result. Patient 5 presented with tooth #11 showing root resorption, thin gums associated with gingival recession. The tooth could not be rescued and needed to be removed. Fortunately, she could have the SMILE technique. The photo on the left shows the initial presentation, while the middle photograph is the day of surgery, after microsurgical tooth removal, implant placement, and a bone/soft tissue graft to correct the recession. Two small microsurgical sutured are visible. 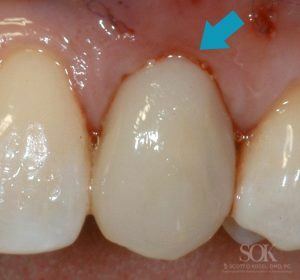 What is important to note, is the lack of trauma to tissues and a very nice biocompatible tooth. It almost looks as if no surgery was performed when in fact, multiple sophisticated procedures were completed. Patient 5 had little to no discomfort with this microsurgical technique.